Jones East 8 helped us greatly in our settling in Kiev, they had the widest apartments' choice in town, and we ended up finding the right place for us! Their highly professional staff always cared about our family needs, it was a pleasure to work with them. I was very satisfied with good and friendly service ... Because of this positive experience I have also recommended your company to others who have been in need of an apartment in Kiev. ... thank you for your kind cooperation and professionalism in supporting our Expatriates with finding the best solution in apartment search. ..thank you for the professionalism, effort and enthusiasm .. and of course, would have no hesitation in recommending you to anyone else seeking an apartment..
.... thank you for your kind cooperation and professionalism in supporting our Expatriates with finding the best solution in apartment search. 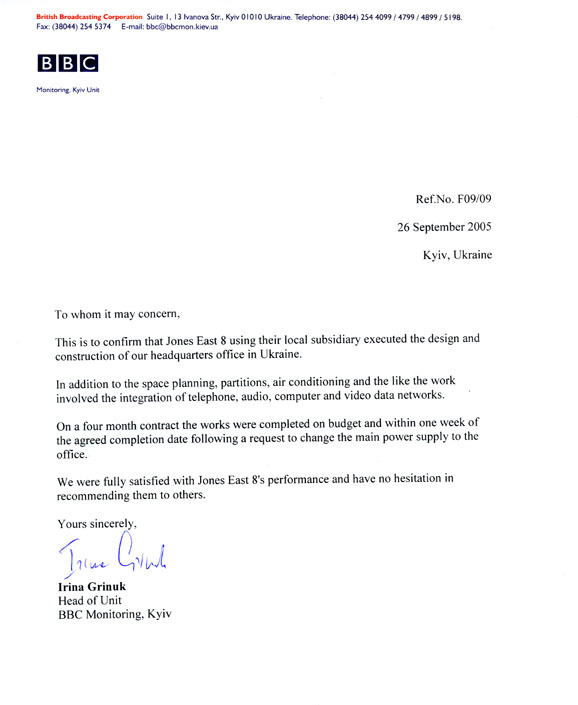 This is to confirm that Jones East 8 using their local subsidiary executed the design and construction of our headquarters office in Ukraine. 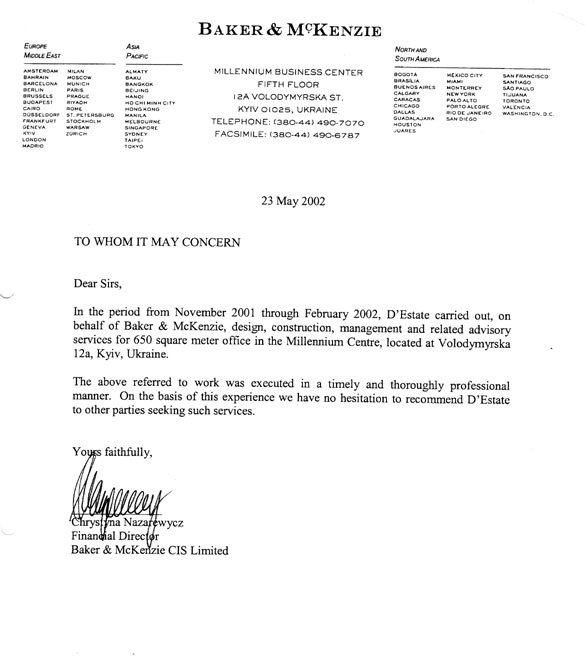 In addition to the space planning, partitions, air conditioning and the like the work involved the integration of telephone, audio, computer and video data networks. On a four month contract the works were completed on budget and within one week of the agreed completion date following a request to change the main power supply to the office. We were fully satisfied with Jones East 8;s performance and have no hesitation in recommending them to others. 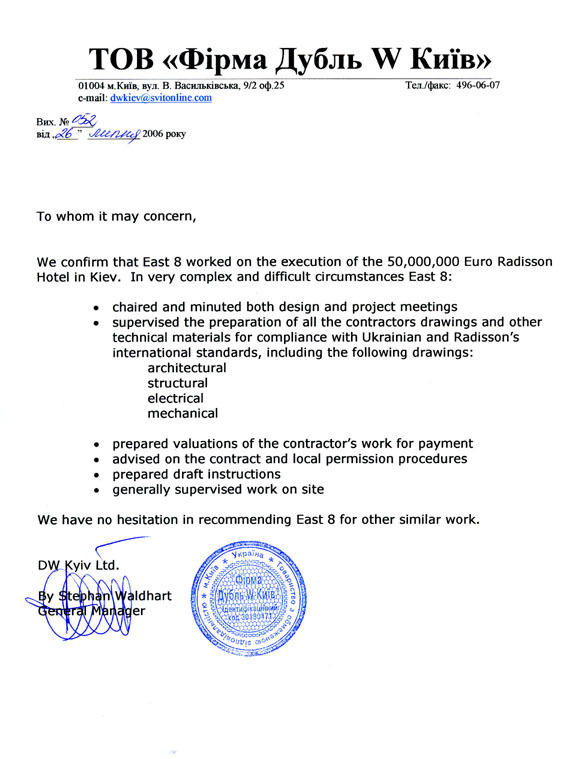 We were looking for leasing a private house fully equipped to our convenience outside of Kiev's city. With the proper support.... from Jones East 8, it was easy to find the right property rather soon. After initial discussion about what we were looking for she organized and guided few visits within short terms and comfortable managed. The clarification of open issues as well as the follow up after decision until the final agreement with the landlord has been made had been professionally managed. Thank you very much for all your help, kindness and efficiency. It is always very pleasant to work with you. I would like to thank you for your cooperation finding the apartment. For me this is now my fourth apartment in Kyiv within 2.5 years. I have worked with about 10 different agents I guess and finally found someone professional in this job. Very many thanks for all your support over the last month. We are all now very much enjoying being in the house - having a garden, being somewhere permanently. It makes a big difference after the upheavals of the last month. The landlords have been very kind so far and hopefully this bodes well for the future. 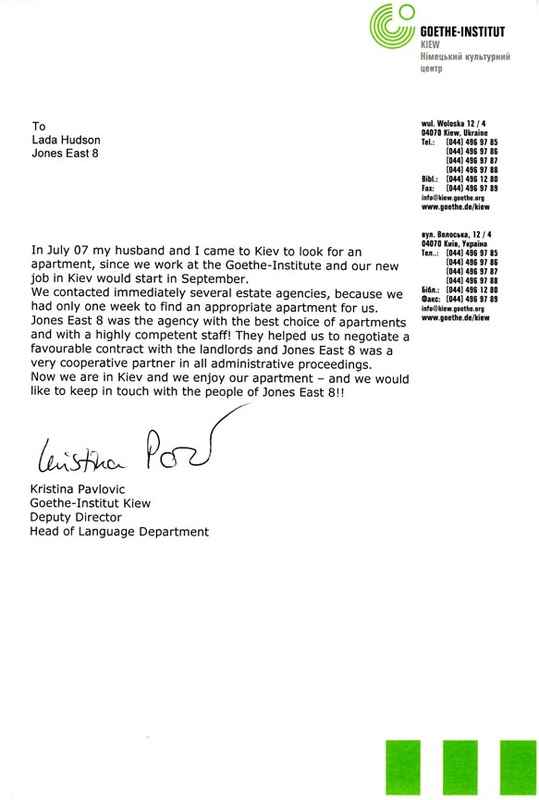 During the time in May 2005, I was trying to find a suitable accommodation for my family in Kyiv. I experienced myself , that from all the Real Estate Companies we tried, Jones East 8 had in quantity the largest number and in quality the best objects available. The professionalism of their personnel shown during negotiations with Landlords was impressive. I have no hesitation in recommending Jones East as professional, as well as trustworthy and reliable.